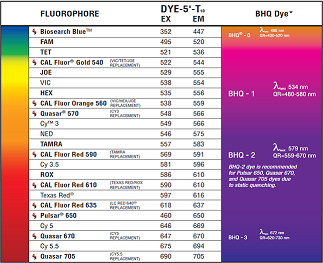 Dual-labeled BHQ Probes are traditional, linear, FRET probes incorporating a fluorophore and quencher covalently attached to the 5' and 3' ends of an oligo, typically 20 to 30 bases in length. Fluorescence is released through the 5' exonuclease activity of Taq polymerase, which cleaves off the fluorescent dye upon the probe's hybridization to its complementary sequence. Dual-labeled BHQ Probes are ideal for detecting the presence and quantifying the amount of specific target sequences. Please be aware that sequences longer than 30 bases are unlikely to have efficient quenching as an end-labeled probe. For such situations please consider positioning the quencher internally instead.